An Events Organiser has commissioned a graphic design company to design the writing style for the packaging of a new line of party packs, that will contain a range of decorations, including self assembly decorations. 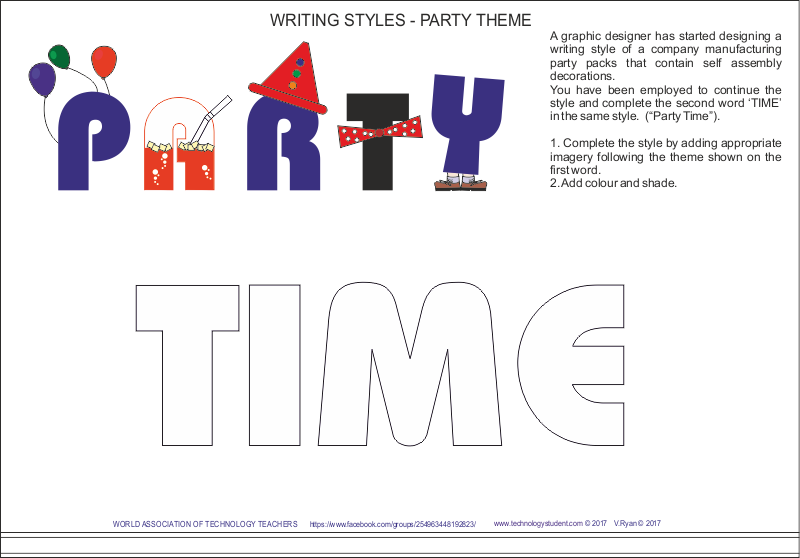 The style of writing seen below has been printed on prototype packaging for the party pack. It has been rejected by the supermarket. Study the style of writing. Why do you think it was rejected? A new style of writing has been developed by the graphic design company. This time the Events organiser has accepted it as being suitable for the packaging. Study the style of writing. Why do you think it has been accepted as suitable? Why is it sometimes important for the style of writing on packaging to reflect the product inside?